Trade shows can be a great way to introduce a new product, attract new customers or continue building relationships, but they can be overwhelming if you’re not well prepared. Trade shows often have hundreds of exhibitors competing for the same crowd. Even if you’re in an ideal location, you only have a few seconds for your business to be seen and heard above all the flash and noise. A striking backdrop. If your business was a book, this would be the cover. Eye-popping graphics can make the difference between someone who stops and someone who keeps walking. Use simple, declarative statements — experts recommend a message of five words or fewer — and be sure your display passes the 3-second test. Potential customers need to be able to understand what you have to offer within that time, or they’ll move on. Your backdrop should be professionally designed by a printing company that has access to high-quality technology. Table covers. This is another instance where less is more. You don’t want to detract attention from your backdrop or signage, you just want to set the stage for an engaging interaction. Stick with basic designs and color schemes that fit your branding. Signs. There are so many options here. You can choose panels, retractable banners, flags and even signs customised with special lighting. Thinking about the setting of your next trade show can help you narrow down the selection. Will you be indoors or outside? Is the location formal, or more casual? Conversation starters. A strong first impression isn’t enough if it doesn’t lead to dialogue. Think about your audience members and how you want to draw them in. What questions do you want them to consider? What can you show them in those precious few seconds that will encourage them to learn more? Do you have an opportunity to sponsor a demonstration or lead a discussion at the show? Can you use interactive technology, such as an iPad with a simple survey, to engage participants? Enticing brochures. Ultimately you want to leave potential customers with an invitation to learn more about what you offer. You want to inform, but more importantly, entice. It might be tempting to include as many details as you can cram into an 8 ½-by-11 inch tri-fold, but if your brochures are too text-heavy, you’ll end up taking stacks of them back to the office. Look for standout images that will capture your customers’ curiosity, a solid mission statement and a well-written testimonial or two. Direct them to your website for more information. Give your brochures a polished look with full colour and textured or glossy paper. Business cards. In a world where most of our contacts are stored in Smartphones and email accounts, a tangible reminder can help your name stand out among countless others. Business cards are just one more opportunity to leave a strong impression. Along with your contact information, be sure to include your logo, a graphic and an engaging statement about what you do. Giveaways. A single trade show often has hundreds of exhibitors. That’s a lot of pens and keychains. The majority will find their way in the glove compartment or the junk drawer. If you choose to offer a branded item, make sure it’s something unique that reflects the personality and mission of your business. Think about your target customer and what he or she is most likely to use. (Hint: Unless you’re targeting dog owners, it’s probably not a Frisbee.) You should also consider whether you want your giveaways to prompt more opportunity for interaction. It only takes a second to grab a keychain off a table, but it takes at least a minute for a potential customer to register for a larger prize or a free consultation. Make sure those passing by have an opportunity to opt in to future emails or mailing lists so they don’t feel it’s being forced on them. If that seems like more of a commitment than you’re looking for initially, consider hosting a drawing for all potential customers who “like” you on Facebook or start following you on Twitter. A sound strategy to follow up after the show. After all the time and resources you’ve spent preparing for the show, you can’t afford to wait to get in contact with interested clients. If you don’t respond to leads within two or three days of the event, your competitors will, says D.J. Heckes, CEO of trade show management company Exhib-it, in a recent Entrepreneur article. Be prepared to pursue them while you’re still fresh in their minds. 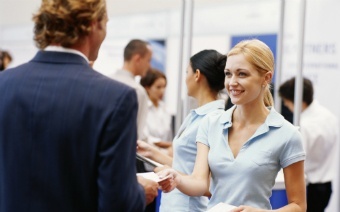 Head to your next trade show with everything you need to give the best possible first impression. Visit Print Shop by Harvey Norman for help with all your business printing needs.